Last June, I had the pleasure of speaking at a press conference at Lincoln Financial Field in support of Pennsylvania State Representative Tim Briggs’ proposed concussion management legislation. I was an eighteen-year old who had been researching concussions in sports for nearly ten months at that point—a task that I engaged in to further educate myself and others on the subject at hand; a project that would essentially close many doors in my past that had been left open for too long. But as I situated myself beside the podium at this press conference, I had no idea what kind of story the young woman sitting to my left had to say. Of course, throughout my research, I understood that others have been through worse—much worse—than what I had experienced, but never did I think I would meet someone I could relate to. It was even more than just relating to, for this individual shared a heartbreaking story to the public. She was at the press conference for the same reason as myself, and that was to promote the need for concussion legislation in our state, but she did more than that. Her words were more than the cover to a bill. Her words were the voice of the sports concussion crisis. Today, Tracy Yatsko, a twenty-three-year old woman from Tamaqua, Pennsylvania, is still fighting the repercussions of an injury that ended her high school athletic career. Six years removed from the moment of her last concussion, Yatsko represents the qualities of strength and motivation, for her battle has not been one that has been easy. Sure, I have heard of stories in which athletes have sustained decisively fatal blows to the head. But when I talk to this woman, and when I think about her story, the only words that I can describe how I have perceived her story is hell on earth. Why did this situation in which Yatsko found herself within come to be? 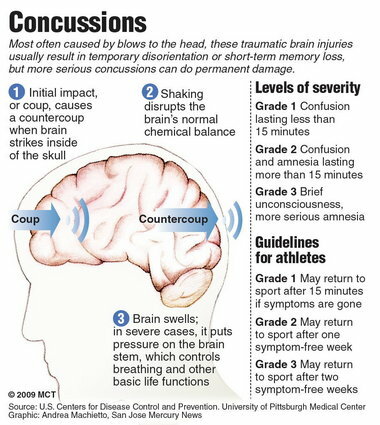 As I began the blog there were plenty of people who told us that what we were doing was “nice” but it will have little effect on the concussion issue. The easiest and actual response was “so what?” I honestly did not care if people didn’t take the information we wanted to present seriously; I KNEW that someone would. The original concept was to gather stories and information from as many sources I could find on the limited time I have to devote to the blog. Fortunately we were able to add contributors that have helped in this endeavor (looking at you Noodle), as well as Parent Advocates and the occasional “anonymous poster”. We believe the information is valid and “blog-worthy” in order to make people aware of the ever-changing issue of concussions. As viewers and commentors have increased over time we believe that we are on the right path. Battle Sports Science CEO Chris Circo says his product does measure rotational movement as well as direct head impacts. Circo, who’s had five concussions and takes anti-seizure medication, says he knows how complex brain injuries are. In an interview, he is more circumspect than his trumpet-like email to the media.